He received his medical degree from Louisiana State University School of Medicine in New Orleans, Louisiana. 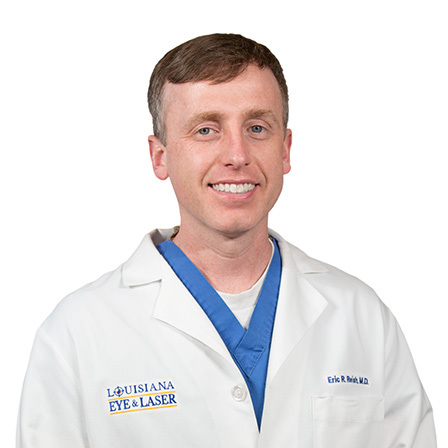 After an internship at Ochsner Clinic Hospital in New Orleans, Dr. Reish also completed his residency in ophthalmology at Louisiana State University School of Medicine Ochsner where he served as Chief Resident. Dr. Reish has trained at Duke University Eye Center, Durham, N.C. and is a member of the American Academy of Ophthalmology. He is certified by the American Board of Ophthalmology. Dr. Reish specializes in diseases and surgery of the eye, including no-stitch cataract surgery, refractive intraocular lens implants and laser surgery for glaucoma and retinal disease, as well as treatment for macular degeneration. Dr. Reish also performs LASIK (iLASIK, Intralase) surgery and cosmetic oculoplastic surgery.